With more than 10 restaurants and dining options to choose from within a few hundred metre radius, Hamilton Island is always offering something exciting and new. Tempt your tastebuds with an excellent range of cosmopolitan cuisine ranging from international fare to the freshest seafood, often quite literally caught at your doorstep. 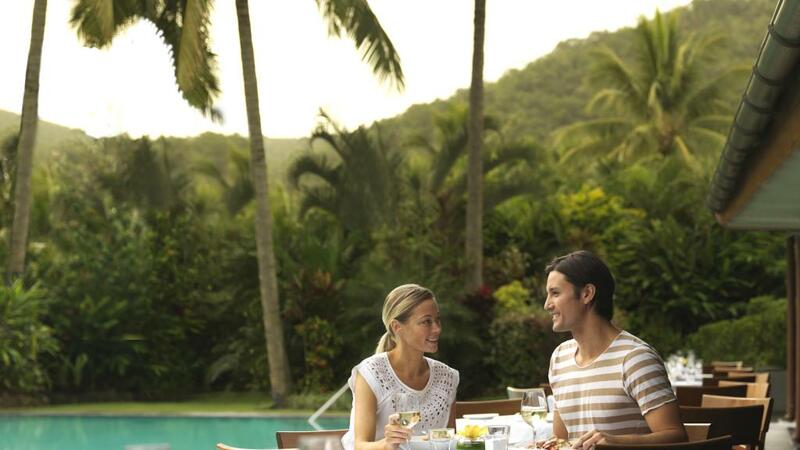 Indulge in a feast for the senses at the diverse range of Hamilton Island dining options including quality takeaway options for those lazy days when you simply can't be bothered getting out of your swimsuit. There are also some great casual dining options where the whole family can feel at home including Romanos Italian Restaurant and Mariners Restaurant, the ideal place to sample Hamilton Island's famous seafood overlooking the marina. For something a little more upmarket, the Beach Club Restaurant woos diners with a majestic beachfront setting, modern Australian cuisine and subtle mood lighting to complete the exquisite scene. Meanwhile, Bommie is the new home of fine dining on Hamilton Island offering white linen, elegant dark wood, a stylish nautical design and marvellous views of the marina along with modern Australian cuisine inside the iconic Hamilton Island Yacht Club. However some of the most popular dining experiences on Hamilton Island are also the most unique. The Denison Star is a 107-foot Hollywood style motor cruiser which offers a four course a la carte dinner cruise. Crafted from Huon pine, the stylish boat offers fabulous star gazing, a secluded location and overall, the perfect evening at sea. For a family affair, breakfast with the koalas at Wild Life Hamilton Island Café is an unforgettable experience where guests enjoy a hearty buffet breakfast as well as the opportunity to get up close and personal with gum leaf munching koalas.